UCL's Atheist, Secularist and Humanist society said its president Robbie Yellon was stepping down to be replaced by former vice president Michael Thor. "Robbie stepped aside because he signed up as president to organise events and run a student society," said Michael Paynter, secretary for the National Federation of Atheist, Humanist and Secular Student Societies. "He did not appreciate the stress he would be under when dealing with a controversy like this, so he wanted to make way for someone else." 'No need' The Ahmadiyya Muslim Youth Association is continuing with its protest against the image, saying it has wider implications. "The principle is more important than who is being attacked - this time it is Muslims and Christians but in the future it could be atheists themselves. "There is no need to print these things other than to cause offence and history has told us that these things cause offence." He added: "I wouldn't say we're specifically pursuing UCL atheist society, it's more about the broader principle." The image that started the controversy was taken from an online satirical comic called Jesus and Mo. The twice-weekly comic strip, running since 2005, depicts Jesus and what creators say is a "body double" of Muhammad talking to a barmaid. The row has prompted debate on the internet with prominent academic and author Richard Dawkins backing the atheist society. 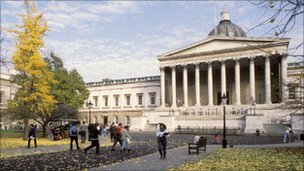 UCL Union (UCLU) said in a statement: "The atheist society has agreed they will take more consideration when drawing up publicity for future events.